Stock permitting, all orders will normally be dispatched within 3 working days, unless advised otherwise. Bespoke & handmade items will take 5-7 working days - during busy periods (such as Christmas) dispatch will take longer, but we will keep you informed. When you place an order it will be confirmed by e-mail and if necessary by telephone. For mainland UK deliveries we use Royal Mail Second Class Recorded Delivery, so a signature is usually required. We make every effort to ensure your item is packaged to a high standard. Unfortunately we cannot be held responsible for the condition in which you receive the package or in the event of late delivery by Royal Mail. Please note that all orders are subject to acceptance and availability and we reserve the right to decline any order. Our initial email confirmation simply acknowledges your order, it does not confirm it or make it legally binding. The order between Follie & you the customer is only accepted when the payment has been processed, stock allocated & the order has been dispatched. 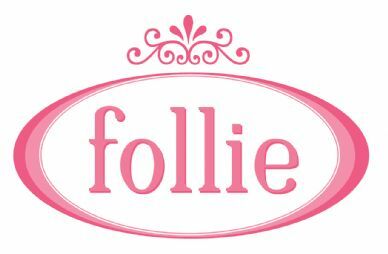 We really hope you will be delighted with anything you buy from Follie, however if you are not happy with your purchase for any reason, you must inform us in writing within 7 days of receipt. You can then return it to us, for an exchange or refund provided that the goods are unused and in its original packaging in accordance with our 14-day returns policy. In the unlikely event that your order has been received faulty or damaged we will arrange with you to have the order returned & either a replacement item sent out free of charge or a full refund issued including any postage & packing costs incurred. If you wish to return an order because you've changed your mind unfortunately we are unable to refund the initial postal charge or the cost incurred for returning the order to us. We cannot be held responsible for any returns lost in transit so we ask that you please obtain proof of postage when returning your order to us or return it by registered post. Refunds can only be issued back to the original method of payment and can take up to 21 days depending on your choice of payment method. If you do wish to return your order please send an email to info@follie.co.uk quoting your order reference number in the subject box so we can send you a Returns Form or alternatively please call us on 01522 579400 to discuss.